TS Sanitary Inspector 35 Posts Notification, Schedule | Online Apply Now : Telangana Sanitary Inspector 35 Posts Notification, Schedule TSPSC recruitment Sanitary Inspector In Municipal Administration and Urban Development. The Applications are invited Online from qualified candidates through the proforma Application to be made available on commissions website to fill 35 vacancies in Sanitary Inspector in Municipal Administration and Urban Development Department. The Examination (Objective Type) dates will be announced after complatation of online application. The commission reserve the right to conduct the exams either comupter base recruitment exams (CBRT) or offline OMR based Exam’s of objective type. Before applying for the posts, applicant shall register themselves as per the One Time online registration (OTR) through the official site. Those who have online registered in OTR already shall apply by login to their profile using their TS PSC ID and Date of Birth as provided in OTR. As specified by the G.O.Ms.No.84, MA&UD (G1) Dept., Dt:14/02/2012. Must possess a Bachelor’s Degree in Biological Science from any University in India or incorporated by or under Central Act, Provincial Act, or a State Act or an Institution recognized by the UGC or an equivalent qualification. The Sanitary Inspector Training Course certificate awarded by the Chairman, Board of Examinations constituted by the Government of Telangana or from Government of India / Government of Telangana Recognized Institution. Minimum 18 years & Maximum 44 years, The age is reckoned as on 01/07/2018 (Rule- 12(1)(a)(v) of State and Subordinate Service Rules). The Upper Age limit will be relaxed as per Rule’s and for more information go through the official notification. (Remittance of Fee) Each applicant must pay Rs. 200/- towards Online Application Processing Fee’s. This apart, the applicants have to pay RS 80 towards exams Fee. The category of candidates exempted from payment of Examination fee. a) BC, SC & ST of Telangana State. The unemployed applicants in the age group of 18-44 years of TS (They have a declaration at an appropriate time to the commission’s that they are unemployed). PH & Ex-servicemen. The Written Examination (Objective Type) will be held at the following centers or as may be decided by the Commission. HYDERABAD (including HMDA Jurisdiction), KARIMNAGAR, KHAMMAM, WARANGAL, and NIZAMABAD. 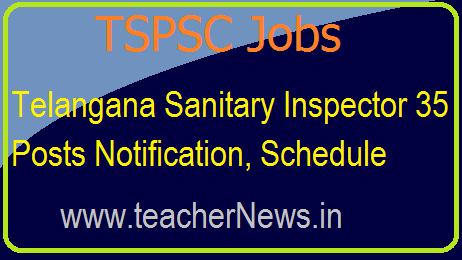 TSPSC Sanitary Inspector 35 Posts Notification, Schedule, Online Apply now at tspsc.gov.in and TS recruitment Sanitary Inspector In Municipal Administration Jobs Notification download.